The central idea of Disappointment theory is that an individual forms an expectation about a risky alternative, and may experience disappointment if the outcome eventually obtained falls short of the expectation. We abandon the hypothesis of a well-defined prior expectation: disappointment feelings may arise from comparing the outcome received with anyof the gamble’s outcomes that the individual failed to get. This leads to a new, general form of Disappointment model. 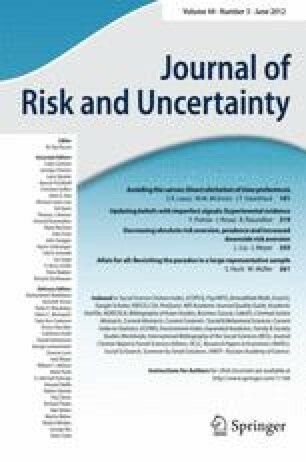 It encompasses Rank Dependent Utility with an explicit one-parameter probability transformation, and Risk-Value models with a generic risk measure including Variance, providing a unifying behavioral foundation for these models.